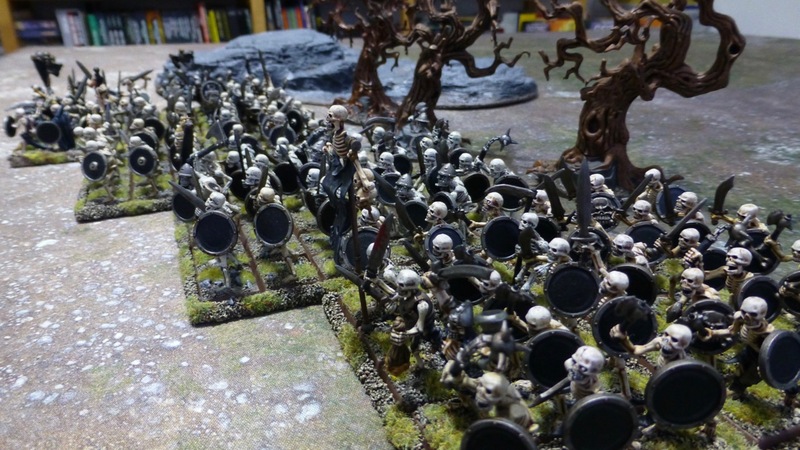 I completed the second half of my latest regiment of Skeleton Warriors for Warhammer Fantasy Battle, bringing it to six ranks deep. The figures are again kitbashes using parts from three different generations of plastic Citadel models. For the shields I used some ornamental bosses this time to add further variety. 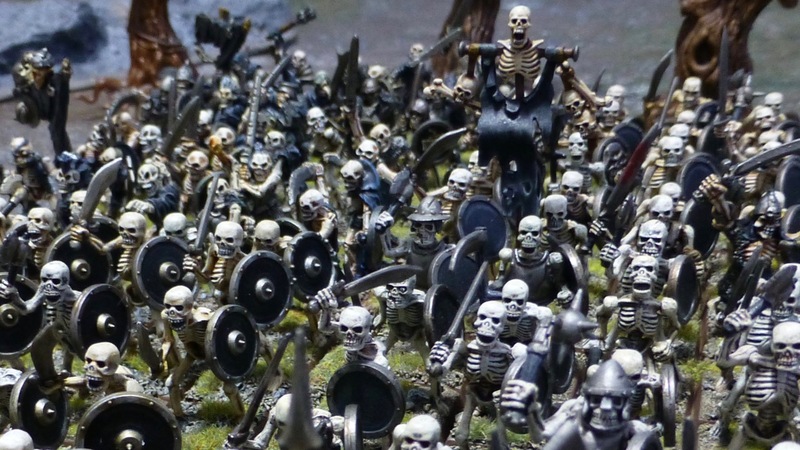 Having completed a third regiment to use with Warhammer 8th Edition in addition to the two units in my 3rd Edition army, I thought it would be imposing to bring them all together in one large skeletal horde. 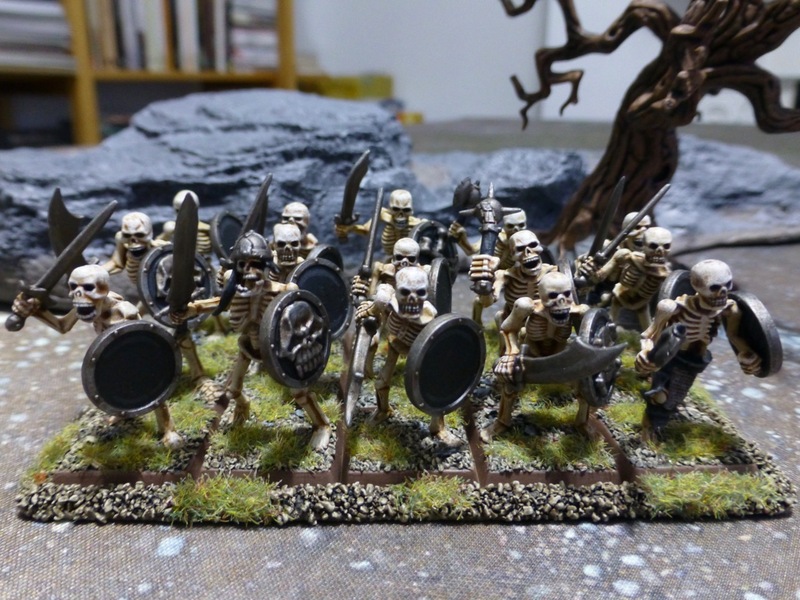 There are still some scythe and pole armed skeletons to paint in my Oldhammer collection, so their ranks are set to grow further over time. For the dead shall walk the earth. 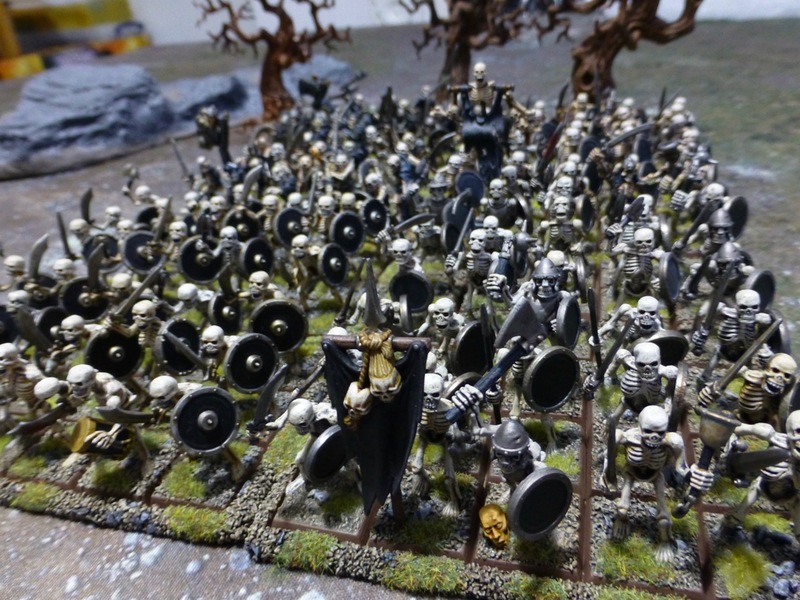 This entry was posted in Warhammer and tagged Oldhammer, Undead, Vampire Counts, Warhammer. Bookmark the permalink. Lovely – there’s nothing quite like a massive horde! Agreed. And with skeletons, it’s even achievable. Epiiiiiiic pictures and paint job! Love it! Thank you! Now if I only had some of your Empire style armies to meet them in battle, it would be an epic clash. Thank you, it’s the culmination of many years of painting skeletons. Here’s to many more to come! Thanks, feels good to bring the mass back into mass battles. What a classic, well ahead of its time in terms of sculpt and production quality in my opinion. 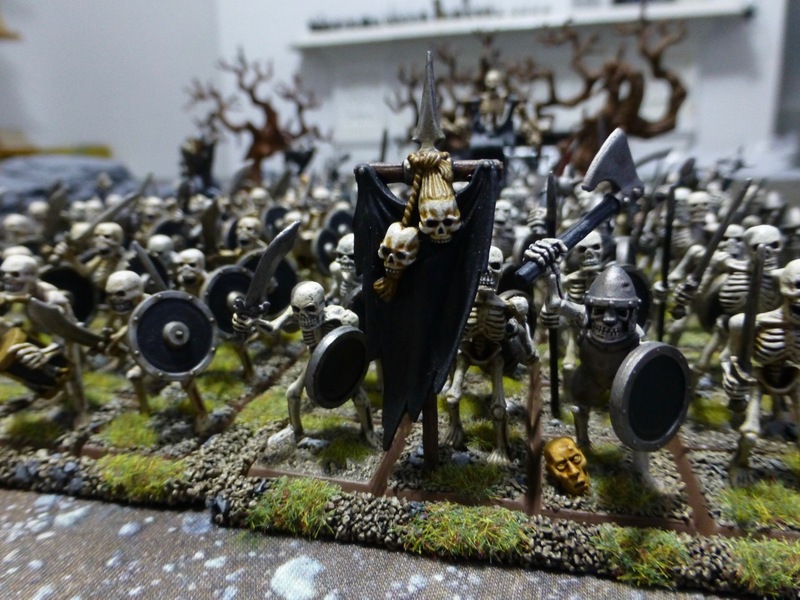 The figures are still serving me well across my undead armies. Unfortunately I don’t have the box, I think I got mine all later when they were individually packaged or maybe traded/bought them off a friend back then. Now that is a magnificent sight to behold… absolutely superb mate. Cheers, it made my own necromantic heart beat once or twice. A sublime sight! I remember when you started the project almost 20 years ago. Legions of dead, a dream come true I suppose – just by working slowly but steadily. And the different generations blend well together indeed. The wind of Shyish was blowing strong back then, I remember the undead rising in your dark chambers as well. What are a mere 20 years to those who have mastered the art of necromancy? Thanks, could do with a couple more skeletons though. Swarms of the bastards! Excellent stuff. Simple, clean and effective. Cheers, I was glad to see that they all look coherent in a single horde despite having been painted over a long period (and without really ever planning on fielding them together).